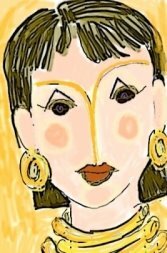 In commemoration of the victims of terrorism (of all faiths) worldwide and in solidarity with Sandmonkey , Big Pharaoh and the rest of those who are holding their own silent vigil because of today's canceled event ( you know who you are ) . It is worth noting that others in Bahrain and Jordan ( hat tip Chan'ad) had also staged a vigil after the London bombings. 1- What does Love mean to you? Love of God, parents and country. 2- What does Marriage mean to you? A contract, you get a best friend + lover. 4- How many children would you like? 5-If given the opportunity, what song would you sing for me on my wedding day? 6- What is your favorite holiday destination? 7-What are three qualities you would look for in a man? 8- What are the three qualities and three bad habits that you have? Minuses: Hard headed, rashness, procrastinator. 9-Where do you see yourself in 10 years? Living on a farm with in-laws, screaming kids and surrounded by pets ;). Can't tag Khadija as she already has kids etc... hmmmm, ok sorry folks it will be Sandmonkey again , and Tareq and Alan : an all guys cast ! Of course I would be more than delighted to have the readers' input too ;) to spice things up a little. Khadijateri tagged me last month , I promised to do it and somehow ended up not, well Khadija it is up now ..so hope you'll forgive me ;) and thank you for remembering me . 1. What is your favorite type of animal that you have had as a pet? 2. What is the strangest/most different name one of your pets has had? Calling one of the budgies "tutut"
3. Describe something bizarre that one of your pets has done. The cat would enjoy toying and torturing cockroaches to death then putting them next to his plate every morning as if to show me what a good boy hunter he was. 5. Have you ever let your pet sleep with you? 6. Do you take your pet on vacation with you? 7. Have you held memorials for your pets? 8. Have any of your pets worn clothing? 9. Do you feed your pets before you feed yourself? 10. Does your current pet resemble you physically or temperamentally? In its NEWS RELEASE of 25th June 2005 ( hat tip Dr.Ibrahim) "The United Nations World Food Programme (WFP) [..] welcomed Libya’s agreement to help cover the costs of its airlift of food aid to western Sudan’s Darfur region, where up to 3.25 million people will require its assistance. [...] The Government of Libyan Arab Jamahiriya has agreed to waive tariff increases on jet fuel for this humanitarian cargo. Without this help, the UN agency would have been forced to suspend the airlift this month because jet fuel was set to rise from 13 to 33 US cents per liter, costing WFP an additional US$1.5 million a month to maintain the airlift operation. [...] Since August [of last year], Libya has a provided a crucial transportation corridor which allows for substantial deliveries of WFP food aid to be moved by truck and air from the Libyan port of Benghazi into eastern Chad and the three Darfur states in western Sudan. The airlift began on 7 May with an Ilyushin-76 aircraft carrying the first 38 metric tons of food from Al Kufra to Darfur. There are currently two daily flights to the North Darfur capital of El-Fasher and the South Darfur capital of Nyala. To date, the airlift has delivered a total of 5,623 tons of food – enough to feed almost 150,000 people for two months". Kudos to Libya for that and hope that more efforts are done to also stop the genocide of Darfurians and the the talks and meetings going on about that in Africa are successful. Iraq has been occupied/liberated(choose your prefered verb) by the US led coalition forces for a little over 2 years now, and thus we have gotten used to the atrocious news from there on a daily basis to the point where unfortunately they hardly register anymore. IMO it has turned like Palestine and Lebanon during the civil war, no matter how many horrible acts of violence are committed it is there in the background for most of us. Yes we care, but we don't know what to do anymore to show how much we care. It is evident, that without a miracle , Iraq will continue to be the hell on earth it is now. With the current world state of affair and my own nightmares this will not be anytime soon ( may God prove me wrong). In my humble opinion , and I'm not lecturing to anyone here, just brainstorming for my pleasure, the problems in Iraq are multilayered. First you have a foreign western occupation ( call it what you wish, for me it is still occupation, because it is still people who are not your own who are running the show in your country), the presence of these troops is exacerbating and humiliating, no matter what you think, and no matter what our wonderful Iraqi bloggers say ( no offense to anyone as I respect and enjoy reading them all). Absolutely no-one likes foreign armies on their land : a good example is Lebanon, the Syrians were begged to come and bring the peace 30 years ago during the civil war, the two countries are practically indistiguishable in language, food, ethnicity, etc yet after their job is the done the Syrian army is felt like a thorn in the side, because it has become a foreign army regardless of historical ties. We all know what happened this year ! But I' m digressing, so we have established that foreign armies are unwelcome, even when they come as saviours ( I am not comparing with the great job the US army did in Europe in WWI and WWII thanks Michael). The coalition forces on the other hand did not come as saviours , but now they are portrayed to be , I am not going to go again into the whole WMD, Saddam scenarios, it's been covered too much , feels like a broken record, what's done is done , this is reality now and we have to deal with it. So if many want to think of them as 'saviour' so be it, it will maybe get them out of Iraq faster? And if indeed they wish to be the saviours then they have to work on that image. (d) it's a free for all mass killing spree , with shia, sunni, kurds, and foreign arab fighters, civilians, ex-baathists, thugs, heros, warlords and mercenaries . (e) the arab /muslim foreign fighters are subdivided into basically 2 groups, those who are of the terrorists mindset and those that have genuinely listened to their heart and naively come to fight -not the 'infidel or the heathen' - from Iraq , but an invading occupying army (in their opinion)...only to discover to their dismay how things are messed up there and not quite like they thought. (f) you also have new Iraqi police and security:killing/torturing Iraqis . In my opinion, everyone in Iraq has the right to kill/destroy the coalition forces by any means necessary if they want, that is not terrorim and not murder, that is legitimate self-defense and freedom even though it is stupid and suicidal. (just in case someone thinks this is a message of hatred, no it it not, it is directed at those in Iraq who profess that they are killing to free Iraqis) . The point is if one wants it then to get it done by not sacrificing your fellow Iraqis, otherwise it's murder. So if someone blows himself up in a US base that's legitimate struggle, and I believe all the people will help. But blowing a market full of Iraqis, or a queue of Iraqi job seekers, sorry that's terrorism. What is going on in Iraq is terrible, it is a civil and regional war with onlookers, cheerleaders, entities and people settling scores.It's just that nobody wants to utter the horrible looming sentence Civil War, because that would even demonstrate more that this latest meddlesome adventure in the ME is not a 100% success. I wish the US would leave and let the players settle their scores no matter what the toll, they have been wanting to do that for 30 years anyway. At least the toll would be less, in time, deaths and money then a prolonged war stiffled beneath the surface by the US forces. Iraq needs to burst its abscess and westerners are cramping its style. You cannot democratize by force but you can point in the right direction, educate and eventually create a correct civil society. The society will not decide of it's own to stop and start behaving in a controlled manner. It has to fight it out first. The fact is no matter how much I sympathise with the plight of Iraqis, I can't really say anything, only my personal opinion, since I don't live there nor have been through what they have, this goes as well for those Iraqis who have not been to Iraq for years ( or to any Arab country for that matter). What is the point of this post you ask ? hmm let's see. Oh yes , what I wanted to say is that in the middle of all this, no killing of any Iraqi should be undertaken in the name of religion or ideology, as the only fair target in Iraq should be the foreign forces so if the Arab fighter who went there with visions of struggle for freedom cannot kill a foreign soldier then they better go home or else pull up their sleeves and help rebuild Iraq. As for the Iraqis killing each other, that's civil war, however just senseless pointless explosions that is TERRORISM. While Iraqi authorities killing. imprisoning/torturing their own, that's business as usual with tacit approval from coalition forces. So while the recent London and Sharm El-Sheikh attack may have deflected a little attention from Iraq recent attacks and spate of terrorism. Iraq has not been forgotten and the innocent victims of terrorism are also remembered dearly, may they RIP. Many have probably heard by now of the horrible bombings which took place in the beautiful seaside resort of Sharm el-Sheikh in Egypt. The death toll has been horrific, double that of the London 7/7 while the injured are also by the hundreds. What is more terrible is that there is not enough coverage of it on western TV , and I see that lamented on several blogs, it is not enough that even the Egyptian governement is not announcing the real figure as Sandmokey says; but that the western media somehow does not see fit to show that the Egyptian count as much as the Londoners? I must admit that some comments on the blog were heartwarming , but still that is so little from the collective brouhaha which happened with regards to London victims. Stop complaining about others and realize your own apathy. Tomorrow the 24 of July at 5:30pm on the 6 of October bridge between Zamalek and Tahrir. There will be banners available but you are encouraged to bring your own. It should last until sunset. This is not for foreign media. This is to send a message to elements in our own communities. We need to tell these bastards that they are not welcome here. I would like to add that you don't have to be Egyptian to show solidarity with them I think , and I'm sure you will be welcomed . So if you are currently living in Egypt or visiting go to their meeting point as per the instructions and say 'No to terrorism!'. I hope someone gets a camera to record the event. I 'm not currently anywhere near Egypt but I'll be thinking about you guys ! Well here is the story of the protest at Sandmonkey's part I and part II ( with photos) and at Big Pharaoh's ...makes a helluva a read. It seems there is no running away from the prerequisite post about the London attacks since on the second anniversary of 7/7 a copycat bombing took place today in London. Like all decent people in the world be they atheists of believers , one must condemn such atrocity, and offer one's condolences to all those who lost loved ones . I admire the Londoner's spirit and stoicism . It was business as usual and there was no great panic or hysterical behaviour unlike 9/11 ( of course I'm aware that the scale was less enormous but death is death ). On this same vein then , every life is precious, be it on a London bus , or on a Baghdad street, and I wish that the Iraqi victims of terrorism ( be it Western, foreign, state sponsored or homegrown) are remembered as well. A collective RIP to victims all over the world. Getting back to the London attacks, it seems that perpetrators of 7/7 were local British boys of Pakistani and Jamaican ( does not even have a Muslim name) ethicities , this is an internal problem that the local authorities should solve, if they are Muslim that does not mean that billions of Muslims worldwide should apologize. It's like saying that all Christians should apologize for the IRA bombings ? So I shall not get apologetic and start talking how Islam is all about peace, the British have dealt with that admirably and they have not gone berseck and started stabbing Arabs or Sikh , or women with headscarve. "NOT IN MY NAME! "THIS PETITION IS GOING TO THE BRITISH PARLIAMENT AND THE BBC TO SAY, WE MUSLIMS DONT BELIEVE IN KILLING INNOCENT PEOPLE. On a similar note I found this post by Iraqi-Canadian blogger Ihath quite fitting please read it here : Degrees of linkedness . Karim also has a blog please also go check it at One Arab World and support his effort. Mustapha from Beirut Spring has some great banners . Go and choose yours. I 've chosen this one. Congratulations Mustapha! This banner from another site common dreams.org is also great you can order a whole bunch, go check their choices. I must conclude the post as I started it, with the London blasts. When I was in Tripoli last week , all the Libyans I spoke with friends, neighbours colleagues, were pained about the attacks and immediately reached out to their foreign friends and colleagues, and many of them said a prayer for the victims. In Islam we believe that the prayer will reach the dead even if one is miles away. 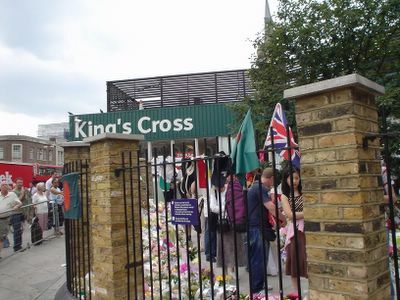 However, since I was in London , I decided to pay a visit to the memorial that has sprung up at Kings Cross and pray for the dead souls in person on my behalf and that of my Libyan compatriots. It was heartening to see all sorts of people and sobering to see so many messages of love. Here is one of my photos. Anyway for all those wondering about me, no I was NOT in London today. I've been back home for the last few days, I'm just busy with some personal issues. Your prayers and good wishes are needed. For this trip to London I went to the theatre last night to watch the play 'Talking To Terrorists' . This play has received a lot of wonderful reviews , check the BBC here and the New York Times here and a bunch of others here ; so my curiousity has been duly tickled and I booked my ticket a few days ago before arriving in London. What could I say more than all those critics and journalists? I loved every minute of the play. Ir was fascinating to watch the actors change characters and accents each time, to the point that I was convinced they were different people and was looking for clues in their faces. The only expected aspect was the usual representation of Muslims, however I'm not taking umbrage as I can see now that this is mostly how the Asian Muslim community talks and behaves in the UK ( no offense to anyone meant, they behave rather differently than the Arabs). All in all it was a successful night and a great idea. Has any of you seen the play and wishes to share their thoughts about it ? Blogging is fascinating, new Libyan blogs keep cropping up this year. Ladies and gentlemen please welcome Tareq, who is blogging all the way from Arizona. He has a pet cat named Leo , he has internet overdose (i.e. it's becoming boring hmmm). Well anyone who loves the feline species is okay by my book. Tareq : Happy blogging , wait and see you'll make tons of friends!